Posted on 22 February 2012 by PaulaPosted in FeaturesTagged 1950s, 1960s, Billy Wilder, blogathon, classic film, comedy, jack lemmon, Oscars, romance, Shirley MacLaine. Excellent article. You describe the movie well, but don’t give away key plot points. Not always an easy thing to do. Thanks! I really try not to give away too much, I hate spoilers. I just hope some people who haven’t seen it will give it a try. 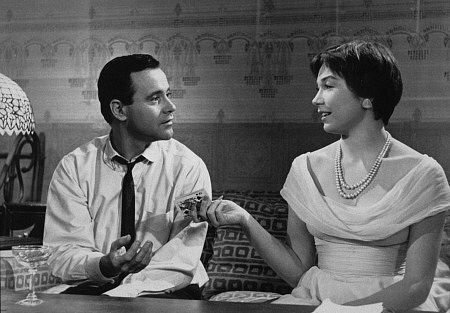 Wilder, Lemmon and MacLaine absolutely knocked it out of the park with ‘The Apartment’! The scenes of the gigantic office building and cramped, busy hives within always bring a smile. Especially when seeing variations of the theme in later films like ‘Brazil’ and ‘The Hudsucker Proxy’. Shirley MacLaine has never been more vulnerable. Jack Lemmon was just beginning to show his greatness for later dramas. And Fred MacMurray reveling in one of his last, great, slimy heel roles! Hi Jack, i totally agree. They are an amazing team. And you’re right, I forgot about Brazil, though I can’t remember Hudsucker Proxy. If I hadn’t seen MacMurray in Double Indemnity, I’d have been in shock. I guess he had just signed a deal with Disney & was worried about their reaction to his taking the role of Sheldrake….I guess it worked out though. And I’m glad he took it. Fred MacMurray had a short career playing superb louses in several films before signing on as Disney’s ‘Absent Minded Professor’ and later on CBS’s ‘My Three Sons’. One of his best is as a slimy, crooked detective in the very decent Noir, ‘Pushover’ in 1954. His Walter Neff in ‘Double Indemnity’ reigns supreme. With his Lt. Tom Keefer in ‘The Caine Mutiny’ a very close second! What’s interesting and watchable about MacMurray’s Sheldrake. Is that Sheldrake knows he’s a slimy s,o.b. and doesn’t care. “Superb louses” — what a great phrase. I’ll have to check out Pushover, one of the many noirs I haven’t seen. To me, he’ll always be Walter Neff or Sheldrake, & yes very true…he is almost sociopathic in his complete lack of conscience. Thanks for participating in this, Paula! Such an excellent review of a beloved classics, I really need to see this soon! I might have to check my local library if they have this one and also ‘It Happened One Night’ as I’ve been meaning to watch that for so long. Alas this is a Wilder film which I have not seen. I do not know what I am waiting for quite honestly, but this just happens to be one that has slipped through the cracks somehow. I agree with your assessment of the merits of the film as well with respect to its competition in the Best Picture category. It is a worthy winner indeed. NAILED IT! Great, great perspective on this Billy Wilder classic, Paula. What a cast, too. I don’t think audiences looked at Lemmon, MacLaine, or MacMurray same after watching them in this. And you’re quite right about its corporate viewpoint. Great contribution. Well done. Thank you so much, that’s very kind of you! I agree the casting really was perfect…it’s difficult to imagine anybody else playing the roles, even though someone else (Paul Douglas) was initially cast as Sheldrake (he died just before filming started). I read somewhere that people so identified MacMurray with Sheldrake that he got a bunch of not-so-nice letters after the movie came out. Great review Paula. I haven’t seen this one, but it sounds like I would enjoy it both for its romantic comedy aspects and for some of its social commentary. I’ll try to check it out! Thank you 🙂 I think you will enjoy it if you do. Like I said, it’s a little dated but a lot of it is spot-on…thank you for stopping by! Fantastic post, Paula! I finally watched The Apartment for the first time last week, and I absolutely loved it. A straight up 10/10 in my book. Fantastic review of The Apartment Paula, one of my all time favourite films. (We actually wanted to do this one for the blogothon but you beat us to it!) I think the issues dealt with in the Apartment are, as you say, as relevant today as they were back then. The film rips your heart out, shows it to you and then helps you see the funny side. Definitely Oscar worthy, 5 stars. Hi Ronan, thanks so much. Yes I completely agree, 5 of 5 stars. Sorry about that…I definitely caught your co-author’s username…I had just seen it on a proper screen & it’s even better like that, in the Cinemascope. The office is even more hive-like and poor Bud looks even lonelier on that looong park bench. Actually there’s part of The Artist, near the end, that reminds me of The Apartment…I don’t want to spoil it, but when you see it, I’d love it if you’d let me know if you think so too. Thanks Ronan! I think The Apartment winning for Best Picture was an example of the Oscars getting it spot-on. It is one of my favourite films and probably the finest achievement of Billy Wilder. It is such a charming experience but has plenty of bite and darkness to go along with the romantic elements. The performances are flawless as is the direction. One of the best films ever made in my opinion. Thank you for commenting! Very good points. Some Like It Hot is lighter, Sunset Blvd. is much darker, but The Apartment has a perfect balance, so that even though it shows us some of the worst of human nature, it isn’t depressing. I agree…it’s one of my favorites & one of the best ever made as well.